I came to know about Ree Drummond (aka The Pioneer Woman) through numerous blogs that I follow but have never tried her recipes. 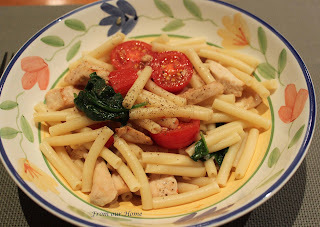 A friend posted a photo of Chicken Florentine Pasta on Facebook and it looked delicious. Fridays are usually pasta days at our home since it's something I can whip up quickly after a day's work and after school activities. Thanks Val for sharing. This recipe is a keeper. I love the colours - green and red against the pale coloured pasta. My girls too love pasta. I will try this one day.